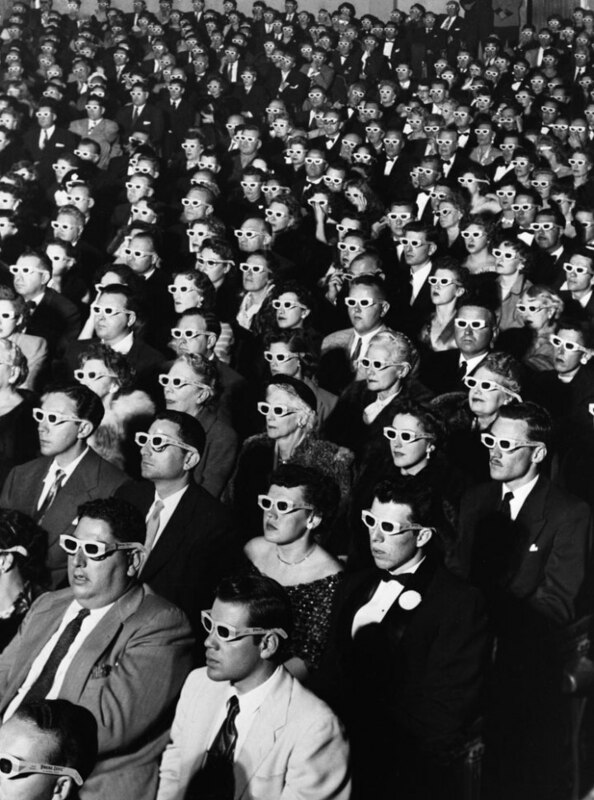 J.R. Eyerman  Audience at the opening-night screening of Bwana Devil, the first full-length colour 3-D movie. Paramount Theatre, Hollywood, 26 Nov 1952. We had a fascinating discussion on commitment and autonomy at the November book club on Adorno’s Commitment! Many thanks to all who joined and a special thanks to Nat Pimlott for facilitating the discussion. We look forward to your company at the next book club, coming up on Friday, 8 December. This time we’re reading Negation and Consumption in the Cultural Sphere, the eighth chapter of Guy Debord’s 1967 book The Society of the Spectacle and discussing détournement with Aris Nikolaidis. For more information, to book your place and download the text please visit the page. In August we visited Benedict Drew‘s exhibition The Trickle-Down Syndrome at the Whitechapel Gallery with students on the Critical Theory in Contemporary Art Practice course. The exhibition was a sprawling interconnected array of objects, banners, screens, cables and digital components. What is the Trickle-Down Syndrome? How does it relate to the infamous laissez faire economic theory? What are the throbbing fleshy forms and knobbly knotted forms represented in videos, banners and roughly-hewn objects? We spent a couple of hours viewing and discussing the exhibition and everyone was asked to write a 250-500 word review that evening for a workshop the next morning. Each review is written in a uniquely different style and approach, with a different interpretation of the exhibition. We were all very impressed by this outcome so we decided to share the results. In January we’re discussing Adam Curtis’ 2016 film HyperNormalisation with Neil Lamont. Please book your place and view the film by following the links on the page. See you there! The list of opportunities, open calls, deadlines, announcements & vacancies is updated regularly. If you would like to post your listing for open calls, opportunities or vacancies on the list please use the contact form to send us the details. J.R. Eyerman  Audience at the opening-night of Bwana Devil. Paramount Theatre, Hollywood, 26 Nov 1952. Patrick Mimran  Billboard Project, New York. Photo by Sophia Kosmaoglou. Neil Lamont  Apple billboard on Paris metro. Digital photograph. Daniel Clowes  Art School Confidential. Eightball #7, Nov 1991. Previous PostThe Trickle-Down SyndromeNext PostHappy New Year!